The RP Photonics Buyer's Guide contains 18 suppliers for white light sources. Ask RP Photonics for advice concerning various kinds of white light sources (e.g. superluminescent sources and fiber ASE sources) or about their applications. In some cases, a white light source really emits visible white light. Such sources are required e.g. for lighting applications and for colorimetry. They may contain something such as an incandescent lamp (e.g., a tungsten-halogen lamp), emitting light with a smooth and very broad optical spectrum. (Spectra of fluorescent lamps or other gas discharge lamps (e.g., xenon lamps) can also look white but are much more structured.) Typically, such kinds of white light sources have a low spatial coherence, making it difficult to tightly focus the light. In other cases, a broadband light source is meant, which does not necessarily emit in the visible spectral region. Such sources can be superluminescent sources, e.g. superluminescent diodes, and typically exhibit a high spatial coherence, making it easy to tightly focus the output or to deliver it through an optical fiber, even a single-mode fiber. On the other hand, the temporal coherence is low according to the large optical bandwidth. Typical applications of this kind of white light sources are white light interferometry, characterization of optical components, and spectroscopy. Supercontinuum generation is a method for obtaining even broader optical spectra. It is based on strongly nonlinear interactions e.g. in an optical fiber. Most widely used are photonic crystal fibers. The input light can be supplied in the form ultrashort pulses, nanosecond pulses, or continuously. For some applications, the optical bandwidth specified as a full-width half-maximum value is important, whereas weak tails in the spectrum are not relevant. In other cases, it is only important to have at least some moderate level of power spectral density over a broad range, even if the power spectral density varies a lot within that range. 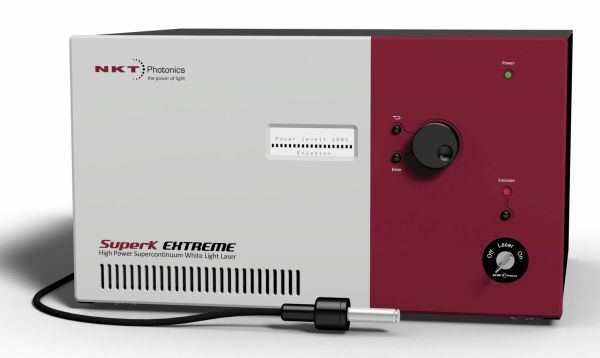 Our SuperK series is the industry leading range of turn-key supercontinuum lasers used by many of the most innovative companies within bio-imaging, semiconductor inspection and scientific instrumentation. The sources are extremely robust and reliable, built for intensive use, and can replace multiple single-line lasers, large dye and gas lasers as well as broadband sources like ASE sources and SLEDs. We offer supercontinuum solutions at every level – from nonlinear fiber and modules to complete turnkey SuperK supercontinuum lasers with plug & play accessories. Our turnkey SuperK supercontinuum lasers have a lifetime of several thousand hours and high power output from 400 to 2400 nm. YSL Photonics' SC-Pro supercontinuum sources have been widely used in the nanophotonics, fluorescence spectroscopy/microscopy, OCT, photocurrent measurement, semiconductor inspection around the world. Our supercontinuum source offers >20 W average power, >200 MHz external trigger repetition rate with the spectrum from 350–2500 nm.